I've been thinking about picking up with blogging again since I started in the MA program in the Global and Area Studies department at the University of Wyoming in August, but since I'm in grad school now, I'm busier than ever. This blog has not exactly been at the top of my priority list, and carving out time in my schedule to blog has been nearly impossible. However, with everything going on in the world right now and the vast array of responses I've seen, I thought I would weigh in on things. What I had to say was going to be much longer than a facebook post or a tweet's worth, so I thought now was the perfect time to start this up again. First, let me clarify my positionality. I believe there is no such thing as an objective stance on an issue, so let me be the first to admit my personal biases. I've worked with refugees and international students, I've made long-lasting friendships with Muslims, and I'm currently deep in research for my MA thesis that pertains to the Syrian refugee crisis. That being said, I think these things illuminate my view rather than cloud my judgement. So yes, I'm going there... I'm going to delve right into the midst of the controversy and explain my own thoughts about whether or not the United States should accept refugees. Wednesday, soon after I arrived at my office, I got a call from a colleague of mine. It was strange timing, but this particular colleague has been connecting me with many people for my research, so I thought perhaps it pertained to that. When I answered, he immediately said, "Did you see what Mead did?!" I hadn't, but he proceeded to tell me that Wyoming's governor, Matt Mead, had joined several other state governors in refusing Syrian refugees. After the attacks on Paris on Friday, November 13, security concerns about refugees have spread throughout a large number of European nations and U.S. states. Beginning on Sunday, U.S. governors started declaring their refusal of refugees. 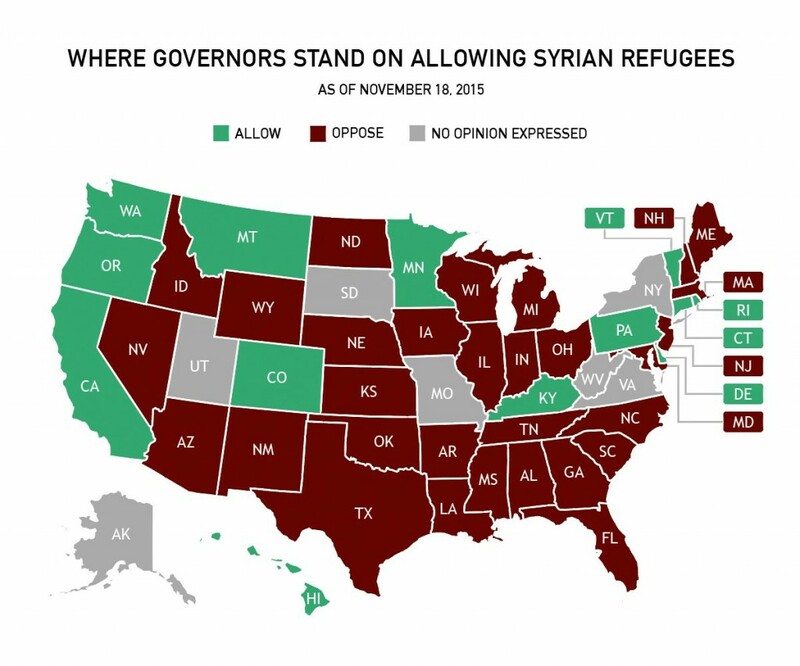 As of Wednesday, 31 states' governors had issued statements refusing refugees. Here's a nice graphic from PBS to give you an idea of which states these are. Now, states do not actually have the power to make these kinds of decisions. Without getting too deeply into that, I'll just say that the Refugee Act of 1980, which was an amendment to the Immigration and Nationality Act and the Migration and Refugee Assistance Act, signed into effect by President Jimmy Carter, places the power to admit (or deny) additional refugees in the hands of the President and the Attorney General. Anyway, my colleague, knowing that I am conducting research on a certain aspect of the Syrian crisis, wanted to see if I would be interested in somehow letting Governor Mead know that the entirety of the Wyoming population is not against refugees. While some governors may have been more informed, it seemed to us like Mead rushed to this decision to go along with what other republican governors are doing (all but one state governor who are against accepting refugees are republican). 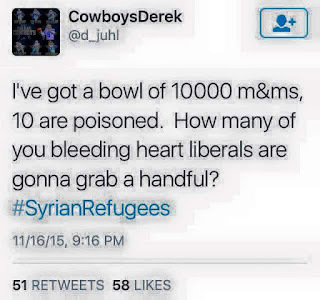 Just to clarify, Wyoming doesn't even have a refugee resettlement program. Thus, this should not necessarily be a big concern for the state. However, Mead also claimed that there are no refugees in the state right now, and I highly doubt that. I believe this was the first thing I commented on. I'd seen it being reposted by a number of my "friends," and I got tired of shaking my head and scrolling on each time. I would copy and paste my comment, but the person whose post I commented on deleted it instead of replying. I said something like, "I understand people are scared, but the ignorance of this post is mind-blowing. 10 in 10,000 is nowhere close to the number of refugees that could pose a threat to the US. This is a terrible thing to spread." "I understand that people are coming from a place of fear; however, it deeply saddens me to see Colorado Pentecostals comment on this in such a way. When I saw this post in my news feed earlier, I was brought to tears and ashamed that I am affiliated with this page. As someone who is educated on these issues and is currently doing research and an MA thesis on issues pertaining to refugees, I can only assume that whoever is responsible for this page did not take the time to fully understand. Please stop spreading this hatred. It is not the Christian thing to do." Throughout the day I began to notice a trend in my news feed that I thought was interesting. Generally, my friends who I know because they're former professors, friends who I know because we had a class together once, my fellow McNair scholars, and fellow grad students were all posting things about how ridiculous it is to equate Islam with terrorism or to equate terrorism with refugees, about how states don't have the power to refuse refugees or about general humanitarian issues for refugees. On the other hand, generally all my Christian (Pentecostal and other denominations alike) friends were posting about how refugees are dangerous, how Muslims are terrorists, and how the U.S. ought to keep "them" out. What can I even say? This breaks my heart. I said I commented on three posts. 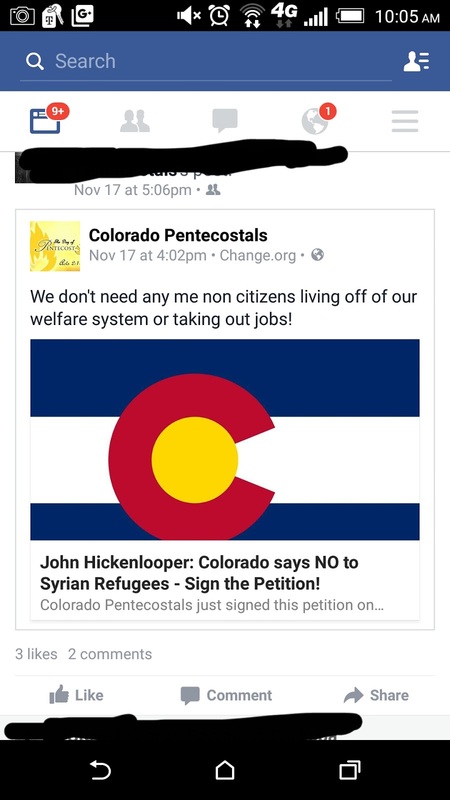 The third was the post of a Christian young lady who shared the link above, "To American Christians who reject refugees" and said, "This applies to more than the American Christian refusing refugees... Everyone read it and reexamine yourself." Yes, she got backlash for saying that. However, other than my husband, she was the ONLY Christian facebook friend I have who brought this to light, so I commented telling her she was amazing for posting it. I am so deeply sorry that you have to constantly defend your religion. I am sorry that people see you wearing a hijab or hear you speaking in Arabic and automatically shy away from you in fear. I am so sorry for many of my fellow Americans' and my fellow Christians' feelings toward you. Let me apologize for my nation's media, for our gossip, and for our actions that spread hatred and equate you and your religion to terrorism. It is not right, and it is not fair. You have changed my life and opened my mind. You are wonderful, amazing, strong people who I have never seen act in violence or aggression. I am sorry people in this country think that accepting you will somehow hurt them. I am sorry that people would rather judge you and discriminate against you than learn about you, your experiences, and your culture. It's such a shame. My life has been enriched by you, and I am a better person for knowing you. Wyoming is supposed to be the "equality state," yet I've never in my life experienced such racial discrimination as I have here. If Wyoming truly was about equality, you would not be so quick to turn away refugees. Wyoming is nearly 93% White, and diversity is almost nonexistent and is rarely welcomed here. Inclusion of underrepresented groups is an issue on the UW campus, and it is an issue in this state, which I am learning more and more each day. I know you may be convinced that refugees are too much of a threat, and I know you may think that Governor Mead did the right thing, but I would encourage you to think about the kind of environment you are creating in your "equality state" by being so hate-filled. I hope that you can open your arms and your hearts to diversity. I hope that you can open your mind to education about the issues you are concerned about. As I expressed before, spreading hatred is not the Christian thing to do. Matthew 25, specifically verses 34-45, is the attitude we ought to be taking on. The Old Testament contains several verses about welcoming the foreigner, or stranger, showing them kindness, and even providing for their needs. The New Testament contains the greatest commandment, to love God with your all of your heart, soul, and mind, and the second greatest, to love your neighbor as yourself. And who is your neighbor? Read the story of the good Samaritan. Think about this... Jesus Christ was turned away and rejected by people from the time he was unborn in his mother's womb as Mary and Joseph searched for a place to stay until the time He died. In fact, He's still rejected by people today. We preach the love of Christ and yet we turn our backs in hatred and in rejection of people who are deeply in need. How dare we? As Christians, we should be shining examples of mercy, love, and compassion. I could insert a list of verses to prove this, but I think you all know them... you just have to remember them now. I had an English professor who would say that proving you're really American meant sticking it to the next immigrant group. History proves this is true. It seems the most recent immigrant group is always the most avid haters of the next. With the current issue of Syrian refugees though, it seems like everyone is getting in on the hatred. How Do Refugees Enter The U.S.? Without saying anything about either Huffington Post or Obama (seen towards the end of the video), I can tell you that the process shown here is accurate. I know this from my time working with refugees in Colorado. Trust me, the U.S. is not sending planes to pick up huge groups of people from the middle of nowhere and dropping them off at the airport nearest you. It is extremely difficult for a refugee to gain entrance into our country. They have to be referred to us from the United Nations High Commissioner for Refugees (UNHCR), considered high risk enough (therefore this is usually mostly women and children), and then they have to get through a series of background checks, interviews, and health screenings. Syrian refugees cannot just walk right in. In this time, I think we ought to remember our history. It's time we remember what being an American really means. You know what the inscription on the Statue of Liberty says? Our founding fathers were refugees in a way. This country has been built on the backs of refugees. In fact, in a sense, we are all refugees and immigrants. Maybe you yourselves are not, but unless you are full blooded Native American, look a few generations back and you'll fine refugees and/or immigrants. We are all tied to them. We are them. And I think that's part of what makes this country so great. If you made it to the end of this long, long post, thanks so much for reading. I realize these ideas are contentious, and I would love to have a dialogue with you about anything and everything I've talked about. Feel free to comment; however, I ask that we try to keep comments a dialogue and not an attack. It would be great if we could approach each other with respect and understanding about where we're coming from and why we think the way we do. I think that's a very biased interpretation of the verse. It could also be interpreted that you should be aware of people who want to lead you astray. There is nothing in that particular verse about killing an infidel. According to your philosophy, God puts people in specific countries...so my family should have stayed in Russia during the Bolshevik revolution and accepted death rather than coming to the US and choosing life. Very unique thinking. How do you think this country was built, so that you had a country to flee to? Because instead of fleeing this country, they stayed and fought and made this country free and great. Lots of blood was shed, and a lot of people chose death instead of fleeing, including many in my family.